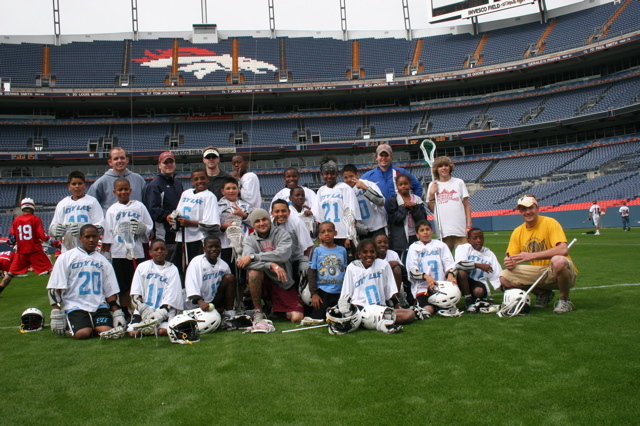 Denver City Lax first appeared on the Colorado youth lacrosse scene in 2007, working to provide inner city Denver kids the opportunity to get on the playing fields. One of our early goals was to use the game of lacrosse to involve elementary and middle school students in a variety of activities that promote self-esteem and help develop a work ethic that can enhance educational aspirations. We still subscribe to that goal, and we continue to work on the big picture of becoming more than just a sports program. City Lax wants to be a program that provides new opportunities for youth both on and off the field. City Lax has grown quickly, now numbering about 100 participants, involving a dozen coaches and numerous supporters. Like most growing organizations, City Lax is a work in progress that to this point in time has devoted many of its resources to keeping up with the demand by kids to join the game. No person has been turned away because they could not afford to play. Instead, City Lax has provided all players from all backgrounds the opportunity to enjoy the sport by supplying equipment, uniforms and a team experience at no charge. The door is open to everyone. The first few seasons have brought numerous challenges, from developing a new organization to locating the resources to provide equipment, uniforms, league and tournament fees, travel and numerous other team costs. We are on track. Boys and girls from the 3rd through the 8th grade are playing lacrosse in neighborhoods and at schools that previously did not know the game. And well over 200 friends from Colorado have lent their support to help make City Lax happen thus far. What’s remarkable are the possibilities of program development that City Lax has envisioned that are waiting to be materialized. Many program ideas are close enough to visualize and feel important enough to encourage everyone’s best efforts. It’s fun and exciting. Spend any time with the organization and you will form new relationships with the kids, families, coaches and friends within the Colorado Lacrosse community that makeup City Lax. We have the deepest regard for the people that have volunteered their time and in the process become hooked on City Lax, and to those that have made it financially possible for us to reach our early goals. US Lacrosse officially brought City Lax on board this past year as a BRIDGE affiliate - organizations Building Relationships to Initiate Diversity, Growth and Enrichment. That was an objective set forth in the initial Denver City Lax plan. We will continue to focus on providing new opportunities for elementary and middle schools kids, find qualified coaches, develop off the field educational resources, establish neighborhood and community alliances, collaborate with mentors and locate and nurture various funding sources. It is your generous support that has helped us come so far, and that allows us to imagine climbing much higher.